Two recent events were significant in shining a spotlight on poverty in Toronto: the release of the Vital Signs report, which demonstrated the growing inequities in our city, and the release of the federal budget, which showed the important role the federal government has in improving the health of our cities. The Vital Signs report, the Toronto Foundation’s annual snapshot of urban life, showed that Toronto is increasingly becoming two cities – one underserved, one not – with quality of life greatly impacted by income, race, immigration status, gender, sexual identity, and age. Vital Signs referenced Daily Bread’s 2017 Who’s Hungry report to help illustrate this increasing inequity, highlighting how Toronto food banks saw almost 1 million visits last year, with the most sustained increase among those aged 45 and up1. This increase happened despite on-paper prosperity and low unemployment rates. How can a robust economy and recession-era food bank demand co-exist? The answer relates to the labour market. People who have fallen out of the labour market, such as seniors or those with a disability who cannot work, are having an increasingly difficult time keeping up with rapidly rising costs of living. The labour market itself is also becoming more fragmented and less likely to provide steady income. And while there has been a pervasive shift in the labour market from full-time employment to more part-time and casual work, there is evidence this shift may not be impacting everyone equally. The Vital Signs report highlighted that racialized groups are more likely than non-racialized groups to be working in precarious or part-time work without benefits2. Similarly, the Who’s Hungry survey found that recent newcomers, including many from Afghanistan, Nigeria, Iraq, and Syria, are almost twice as likely than non-recent newcomers to be receiving their main source of income from employment. Despite earning more than the minimum wage, respondents reported only being able to get jobs with part-time hours, and having to skip meals because they are paying upwards of 74 per cent of their income on rent3. With this kind of financial pressure, skipping meals and/or accessing food banks becomes a necessity, despite living in the wealthiest city in the country. 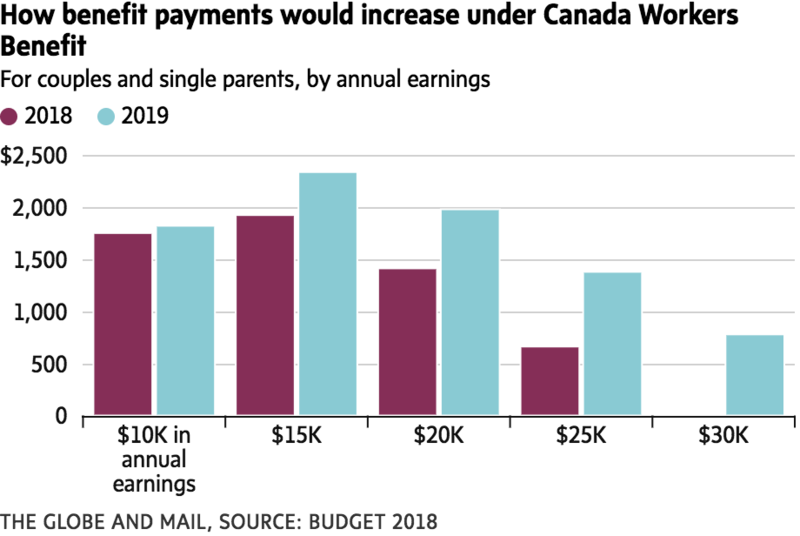 The 2018 Federal Budget took an important step in acknowledging the increasing precariousness of the labour market by creating what the budget referred to as a more “generous” and “accessible” Working Income Tax Benefit, now rebranded as the Canada Workers Benefit. The 2018 federal budget commits to increasing the amounts given to those who are eligible, as well as increasing eligibility by expanding the income range so more low income workers can access it. For instance, a single parent or couple earning $25,000 a year could receive as much as $717 more from the program in 2019 than in 2018. And those earning $30,000 per year are now eligible to receive the benefit, whereas in 2018 they would have not been eligible. A single, unattached person could receive up to $500 more from the program, and singles earning $20,000 a year are now eligible. This is an important step towards greater income security and we are pleased to see it come to fruition. In 2007 Daily Bread had praised the introduction of the Working Income Tax Benefit, but we also pushed for a more generous benefit that would provide more money and raising the “phase-out” points so more working poor could access it. This is particularly important for income security for many working poor, including food bank clients, who receive more than the minimum wage but are restricted in the number of hours they get at work. The federal budget also commits to increasing access to the benefit by enabling the Canada Revenue Agency (CRA) to automatically determine eligibility, instead of a potential recipient having to apply separately and potentially miss out on receiving the benefit. All too often we see food bank clients, seniors in particular, who are not accessing their benefits because of a lack of awareness, no access to internet, or not being able to read the forms due to language barriers. Moving to automatic enrolment is just as important a step as the increase in benefits itself, which the government estimates will enable 300,000 additional low-income workers to access it. But it is worth highlighting again that what appears to be simply an administrative change (automatic enrolment in the CWB) can have a potentially large impact on improving the lives of people living on low income, particularly groups such as recent newcomers, those who don’t speak English as a first language, and other vulnerable populations who are more likely to encounter administrative barriers when trying to access government services. This is what we are calling the pragmatic face of equity. Other measures in the federal budget, such as investments in affordable housing, and indexing child and seniors benefits to inflation underscore the federal government’s crucial role in income support – indeed, what is becoming more evident is that all three levels of government have a role to play in helping to create more equitable and just cities. 1Toronto Vital Signs 2017-2018, pg. 35. 2Vital Signs Report 2017-2018, pg.71. Daily Bread Food Bank submitted our feedback (below) about proposed inclusionary zoning legislation. Daily Bread Food Bank is a non-profit organization that provides food and support to almost 200 food programs and 136 member agencies across Toronto. We welcome the opportunity to comment on the proposed regulations under the Planning Act related to inclusionary zoning, posted on the Environmental Registry. The legislation introduced in 2016 that would permit municipalities to enact Inclusionary Zoning by-laws was a promising development that would potentially enable cities like Toronto to have another policy tool at their disposal to help address our current crisis of housing affordability. Unfortunately, the current regulations as proposed are unlikely to help create more affordable rental housing, and the needs of low income households – the group buckling the most under the pressure of shelter costs – are not addressed. Last year alone there were over 990,000 visits to Daily Bread’s member agencies and to North York Harvest food banks. Food banks in the former inner suburbs are bursting at the seams, seeing a nearly 70 per cent increase in client demand since 2008 – an increase that can be directly attributed to skyrocketing rents. As Daily Bread’s research shows, those accessing food banks spend on average 70 per cent of their income on rent, and many report skipping meals to afford TTC fare in order to get to jobs or doctors’ appointments. We urge the province to adjust these regulations so that they enable the development of more rental properties in order to help address the housing crisis in our city. It is not an unreasonable goal that people – regardless of their level of income – should be able to afford to rent a decent home near to where they work, go to school, and access essential goods and services. We also urge the province to enable municipalities to have the flexibility to designate the maximum level of affordable units (maximum caps) depending on need of various communities, in addition to setting minimum caps so as to adequately disperse the supply across the province. When it comes to increasing the availability of affordable housing, there is no silver bullet. Indeed, properly crafted Inclusionary Zoning needs to be an essential part of a range of policy tools that can help address the escalating housing crisis in the City of Toronto. Making the aforementioned adjustments can further demonstrate the Province’s commitment to improving not only the lives of the most vulnerable but also the growing number of middle-income earners who are being squeezed out of both the rental and home ownership markets in Toronto. Done right, Inclusionary Zoning will help ensure cities like Toronto remain resilient, accessible, and inclusive for everyone regardless of income.